Classic. What does Cherry flooring bring to mind? Tradition. The mom and pop shop down the block. The promise and warmth of home. Modern. The Staybull® line of recycled Cherry flooring takes that spirit and reinvents it to create flooring for modern and contemporary interiors. Boasting a majestic array of vivid golden and reddish browns hues, each plank you install will also be more resilient against wear and tear than standard Cherry flooring. 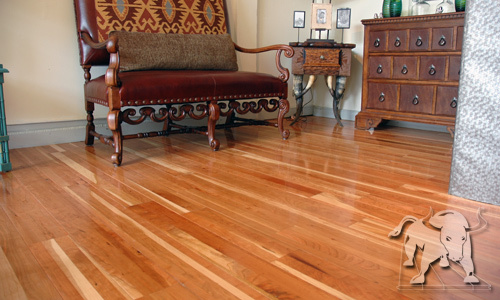 It’s no wonder why designers rave about how refreshing it is to finally find eco-friendly Cherry flooring that complements modern design styles. American Cherry with a twist. Call to order a free sample from Staybull Flooring®.